Over the course of patch 6.2, Blizzard switched via meta-achievement freely flying in Draenor. For this you must, however, address some tasks that can sometimes cost a bit of time - depending on how far you're already advanced in the game. In this article we show you a few steps, as you go up in the New World. Patch 6.2 for World of Warcraft is about to release. It is currently strong to go, because the last few days the Release Candidate has been loaded onto the PTR. Over the course of Patch 6.2 Blizzard will lift the flight ban on Draenor again. This was confirmed by the developer in an official developer blog. However, for one or the other task is asked of you, depending on how far you have progressed. Below we show you what you need to do to take to the air soon. To successfully unlock the fly, you need the meta-achievement credit "Boy Scouts of Draenor". This you deserve in the course of patch 6.2, by "the free world copes of Draenor, meaning the areas of Draenor researched 100 of treasures in Draenor, the successes of "Loremaster of Draenor" and "assurance of Draenor" and a reputation of at least reached "respectful" at the three new factions in Tanaan Jungle. "says Blizzard. We see the individual successes at times accurate. To dust off this success, you have to explore all the angles of Draenor. There must be no play "Fog of War" are more about the continent. For this it is often necessary to go in rear corners. To maintain this success, you have to complete each available Apexis Daily, which is offered to you. Easy to do it with the scout reports, which have existed since patch 6.1. However, this cost Garrison resources. But you can also complete several a day or two the same time, when the Daily has just happened to turn. 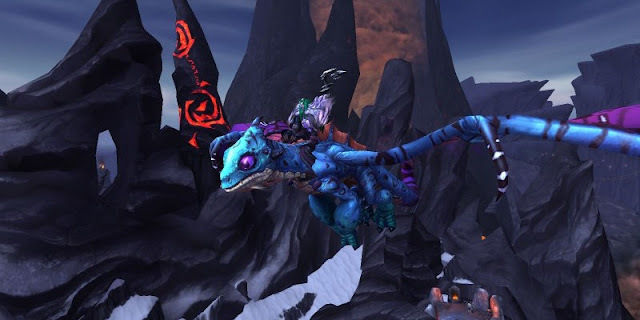 Worth the way for the new Mount that exists for 150,000 Apexis Crystals. "Loremaster" the players already know from other areas in World of Warcraft and exactly this success also works in Draenor. For this you have to complete all the Story quests in the continent. With Warloards of Draenor but there is a convenient service for this success: In each zone the missing functions in the sidebar of the Map are listed. Don’t you know more once, scans the Quest hubs or ask a GM. Yes, the latter is perfectly legitimate and is also available in the ticket system. Of course you should go before anything else happens to the search. This achievement requires you to reach a minimum "respectful" reputation among three factions in the jungle. This plan you can speed up in the garrison with the trading post building. This is expanded at level 3, you get always 20 percent more Reputation Points. The hat and the Carousel of Buff Darkmoon market you level the fractions in rocket speed! This success can sometimes be a bit annoying if you "Loremaster" have not yet been completed. Because then you will gain access to treasure hunters cards that you show the treasures on the map. Those who prefer straightforward, the add-on "HandyNotes" downloads, which takes over the same job. The success of "Grand Master, treasure hunter" shows you how far you are already. That's it!